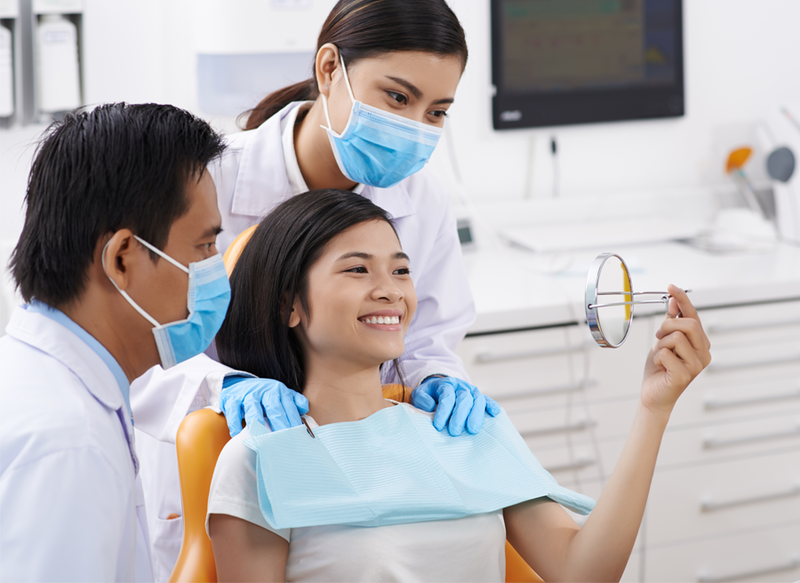 General dentistry involves diagnosing, treating, and preventing of a wide range of dental conditions. It also involves the maintenance of overall oral health for patients of all ages. General dentistry encompasses the basics of both restorative and cosmetic dentistry specialties. At Prosthodontics of New York, we focus on a variety of restorative treatments to repair or replace teeth that have undergone damage. Dental crowns are natural looking, tooth-shaped caps that help restore a damaged tooth. Crowns are usually necessary when a tooth has gone through enough damage that a dental filling would not suffice. Dental crowns can help hold a cracked tooth together, can support a tooth with a large filling, and cover misshapen or discolored tooth. CEREC is a 3D system that creates dental prostheses such as crowns in our Manhattan offices. This quickens the process of receiving a crown because we do not have to have it created at a separate dental lab. CEREC crowns provide several advantages to normal dental crowns. This process is much more convenient than having to come to the office for an additional appointment. Also, the dentists are able to preserve more of your natural tooth and do not have to make any dental impressions. This also means that patients will not have to wear a temporary crown. CEREC crowns are just as strong and durable as those made in a dental lab. A dental bridge is another reliable option for tooth restoration. A bridge is a fixed structure that is customized to look like natural teeth. An immediate correction that can be improved with a dental bridge is a gap left by missing teeth. By closing a gap in the teeth, dental bridges help reduce the risk of gum disease, improve speech, restore the ability to chew, prevents other teeth from shifting and overall preserves your natural smile. At our Manhattan office, we offer three types of bridges including fixed bridges, resin-bonded bridges, and cantilever bridges. At Prosthodontics of New York, we specialize in dental implant restorations. Dental implants are titanium anchors placed in the jawbone to hold replacement teeth. Implants are a great option for those with one or more missing teeth. Dental implants look, feel, and work just like natural teeth. Besides allowing people to smile confidently, dental implants can also help slow down bone loss in the jawbone that can accompany tooth loss. Dentures are custom-fit prosthetic devices for missing teeth. In addition to the fit of dentures, the color and shapes of each tooth is unique to the patient. Complete or full dentures are those that have lost the majority or all of their teeth. We also offer fixed or partial dentures for patients that have lost only a few teeth. It is important that patients take care and properly clean their dentures to maintain good oral health. In contrast to full dentures, partial dentures can be placed around teeth that are still in place, instead of replacing the full set of teeth entirely. Partial dentures can replace one or more missing teeth, restore the appearance and function of the teeth as well as reduce the risk of gum disease. Partial dentures should be cared for just as regular teeth with brushing twice a day, flossing, and regular cleanings. Full mouth restoration, or full mouth reconstruction, includes a variety of restorative treatments to completely transform your smile. A full restoration includes reconstructive all of the teeth in both upper and lower jaws. Full mouth restoration can include the use of bridges, crowns, implants, and also veneers. Typical candidates for this treatment include those that have missing teeth or severe damage from decay, injury, tooth grinding, acid erosion, or malocclusion. If you think you are a candidate for any of our general or restorative treatments, contact Prosthodontics of New York. Call us at 212.758.9690 to schedule a consultation. Our practice serves Manhattan, NYC, and surrounding areas.